A platform for high schoolers to gain opportunities and connect with other students, graduates, and professionals. It is not easy for high school students these days to find internship, jobs, or research positions. When we interviewed 34 hackers yesterday, 30 of which were in high school, we found that 60% of students have tried to land a position in a lab as a volunteer or intern at an organization. However, not all successfully found a suitable opportunity and 72% of them found age (being in high school) to be a limiting factor. There is currently no large scale platform specifically targeted to help high school students find suitable opportunities. So, as a solution to this deterrent, we created an interactive platform called PolyBees in which high school students, college students, professionals from organizations, student club leaders, and others can effectively communicate with each other and offer and receive opportunities. We used the a wireframing and mock up tool called Balsamiq to create the frames for our website and then we converted the frames to code using an application called Napkee and then went on to debug user interface translation errors in HTML and CSS style sheets. 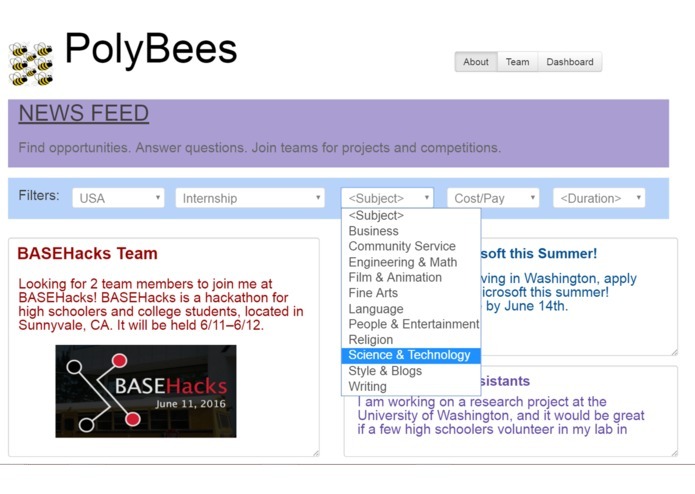 So, with PolyBees, what’s in it for each group of people? (Still managing to get sleep!) Just kidding... Another accomplishment is that we were able to identify and solve an issue very relevant to high school students today, including our team!